Ad-blocking extensions are now widely used. However, not every website owner is aware that some content blockers don’t just block ads, but also stop third-party tools like analytics solutions from doing their job. As a result, visits by users with ad-blocking extensions may not be properly tracked and counted. According to the PageFair Report, ad-blocking grew by 41% globally in the last year. It will soon become one of the major factors impacting your analytics data accuracy. In this blog post we discuss the challenges and provide you with some possible workarounds. Ad-blocking software helps users to avoid seeing ads cluttering a page or having their data sent back by third parties. Such tools can be installed as a browser extension for desktop machines, or as an app for mobile devices, to remove ads from the internet. Why is Ad-blocking Such an Issue for Analytics? Practical as it may seem, content blocking software can prevent pages from rendering properly, thus preventing your analytics platform from giving you the right insights. Perhaps you don’t even know how far from reality your reports are. And since analytics data accuracy is crucial to your strategy, you don’t want to be making critical business development decisions based on incomplete or just plain incorrect information. And if you think ad-block skewing shouldn’t worry you, have a look at the PageFair Report. There are around 200 million active ad-block users around the world, and the install rate is growing exponentially with every year. The estimated loss of global revenue due to blocked advertising in 2015 reached almost 22 billion dollars! In September 2015 ad blockers entered the Apple ecosystem when the company announced they would allow third-party development of ad-blocking apps in the next version of the operating system. Just after the release of iOS 9, ad-blockers topped the list of the most popular paid apps downloaded from the iTunes store. So even if this doesn’t seem like a revolution, it certainly can be treated as a word of caution for all websites which rely on accurate analytics insights. Understanding the way adblocks work is a crucial step to get our analytics data back. There are two systems involved in the process of content blocking. The first one, called Element hiding, means that the app or extension injects an inline snippet into the page. This piece of code hides any HTML element of the page that can be regarded as advertising, for instance a link to doubleclick.net, or an element with id or class attributes values like “text-ad,” etc. The other system, called asset blocking, involves the extension instructing the browser not to download an asset if its URL includes specific keywords or expressions, such as “advert”. That’s why files coming from certain websites, such as google.com/analytics or with names, such as “omniture.js” or “analytics.js” will be hidden or banned from being downloaded by the browsers with enabled adblocker. If you want to host the analytics file locally but also have the latest version of your software all the time, then a self-hosted platform, such as Piwik PRO On-Premises, may be exactly what you need. Piwik by default gives you a possibility to customize the tracking pixel scripts or rewrite the tracker url to bypass ad blockers and in consequence keep your analytics data much more complete. Regular releases include new features, an expanded referrer spammers list, and other improvements to make sure your reports are as accurate as possible. The one-click Piwik upgrade means that you can have your platform ready and up-to-date within seconds. Plus Piwik by default comes without the data sampling issue that haunts platforms such as Google Analytics. In one of his recent posts, Filippo Valsorda, an Italian specialist in cryptography and security, described the tests he had run on his website, comparing a few popular extensions for what they block. He observed that while many popular ones, such as Ghostery, uBlock Origin or Disconnect do block Google Analytics’s tracking snippet, they don’t stop Piwik from doing its job. And as a result, within 24 hours of test, Piwik tracked 18% pageviews for Valsorda’s blog than GA. Quite a discrepancy! In the world of ubiquitous commercials, ad blocking software has been experiencing exponential growth. As a result, these tools significantly limit tracking capabilities from third party advertisers. That’s why your customer analytics data can be skewed or inaccurate. Don’t risk missing out some crucial information, try self-hosted Piwik. 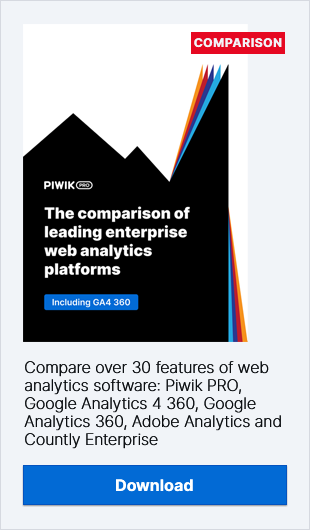 And if you’re looking for enterprise analytics solutions, then definitely give Piwik PRO On-Premises a go.